Here at Millennium Precision, we proudly stand behind and support law enforcement agencies. In the law enforcement industry, part failure is never an option; with lives on the line, our law enforcement customers turn to us knowing their products will not leave our facility without a thorough inspection. Our ISO 9001:2015 certification shows our commitment to quality assurance and gives our customers peace-of-mind that they will never have a part fail due to manufacturing defects. Millennium Precision provides engineering support to our customers to aid in the creation of their final design. A part failure in the law enforcement field can impact public safety and the safety of law enforcement personnel, so our engineering support team is willing to help during any step of the design process to ensure properly designed parts. Not only are we able to run a large production volume, but we also allow for single-part prototyping. Our customers value the ability to create single prototype pieces for testing purposes, as it allows them to ensure their design is optimized before mass production commences. With many law enforcement products, part dimensions are critical for proper performance. Our state-of-the-art manufacturing capabilities allow us to consistently produce parts with tolerances as low as ±0.0001in, which is more than suitable for nearly every application. By nature, the law enforcement industry requires a variety of materials for various components. 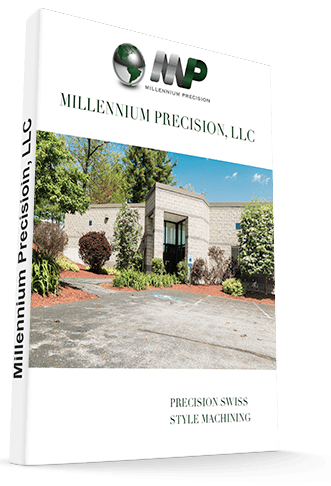 At Millennium Precision we carry over twenty materials in-house, ranging from nylon to titanium. Whether our customers need a semi-rigid bushing for a mounting rack or a solid steel bracket, we have the material and the capability to produce it. Our part dimensions are also incredibly flexible; with maximum lengths of 12 ft. and maximum diameters of 1.5 in., we can turn nearly every design into a final product. Millennium Precision has the resources to supply turnkey components requiring additional services such as heat treating, plating, grinding, polishing and electroplating. Over the years we have built a strong network of suppliers in the industry that are always willing to support what our customer needs. Our supplier base is one of the best.